Available Now! Citrix on Google Cloud! At Citrix, we believe that enabling customers and partners to choose any public cloud platform that they want for running business workloads is critical to success. Since our first public cloud platform offering, we have made great progress in ensuring that platform choice is front and center for designing the secure digital workspace of the future. Many of our customers that are running Google and Citrix solutions like Receiver for Chrome, Android in the Enterprise with XenMobile and G Suite with ShareFile asked what about Google Cloud and we listened. Earlier this year, Citrix and Google announced a broader collaboration to support Google Cloud for Citrix Cloud and our XenApp and XenDesktop Service. We thought it would be only pertinent to talk about the technical architecture of how Citrix Cloud and XenApp integrate with Google Cloud Platform (GCP). Let’s start with a brief overview of Citrix Cloud with GCP. Citrix Cloud is a cloud-based management and integration platform service that simplifies the management of the Citrix infrastructure required to deliver XenApp and XenDesktop. In a Citrix Cloud model, the key components such as a Delivery controller, StoreFront, SQL, and License server are all managed by Citrix. This architecture simplifies the day to day management and reduces the IaaS requirements in GCP for Citrix.The key components required to connect Citrix Cloud to GCP are simply just the cloud connectors which are a set of VMS which provides high availability (HA) stateless SSL connectivity to Citrix Cloud. Of course, Active Directory is required as well, and with that prerequisite, in place, the Cloud Connectors will enable that as a resource location in Citrix Cloud. Example 1 is a reference diagram of how Citrix Cloud and GCP can deliver XenApp workloads using the NetScaler Gateway Service which provides the secure remote access for applications in GCP. Today, GCP cloud locations have over thirteen regions, 39 zones and over 100 POP (Point-of-Presence). Each region has a minimum of two zones which is critical for HA deployment of IaaS and Citrix workloads. 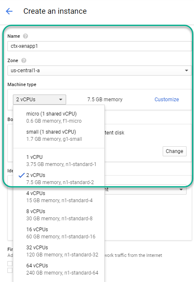 Google Compute Engine (GCE) for IaaS provides several unique features such as containers, quick VM boot, and custom machine types. GCE custom machine type allows the architect to find the sweet spot of defining the exact amounts of ram and vCPU required. Often predefined VMS may not be sufficient for applications, and custom machines types solve that challenge. Each GCP region has specific Intel CPU platforms available and given the vast array of processors choices such as Sandy Bridge, Broadwell, and Skylake, the need to set a specific type may be of interest. Selecting the CPU type can be accomplished by either creating a template and specifying the CPU minimum type using Google SDK or from the UI under the CPU platform menu. Lot’s of great information so far, but I’m sure you are wondering how do I get started deploying XenApp in GCP? How does XenApp scale in Google Cloud Platform? What are the costs involved in Windows instances inside GCP? And is there a step-by-step guide that walks me through setting up Citrix Cloud and Google Cloud? Well, you are in luck! The Citrix Cloud and Google Cloud deployment guide will help answer some of those questions and more while walking you through step-by-step to help you deploy Citrix on Google Cloud. We are looking forward to listening to your feedback so please feel free to let us know what you think.